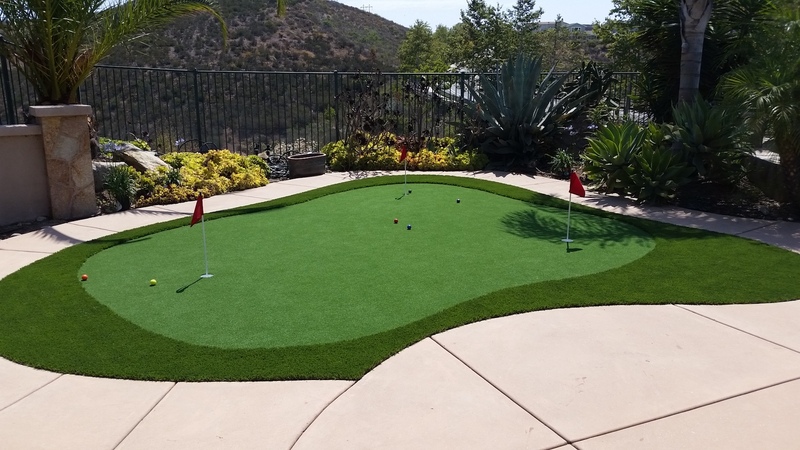 If you are an avid golfer or looking to add a piece of neat entertainment to your backyard, then a home putting green is what you are looking for. Putting greens are helpful to take a load off after a long day, to entertain guests, or to improve your short game. They are usable year round, and require little maintenance once installed. Why install a home putting green? 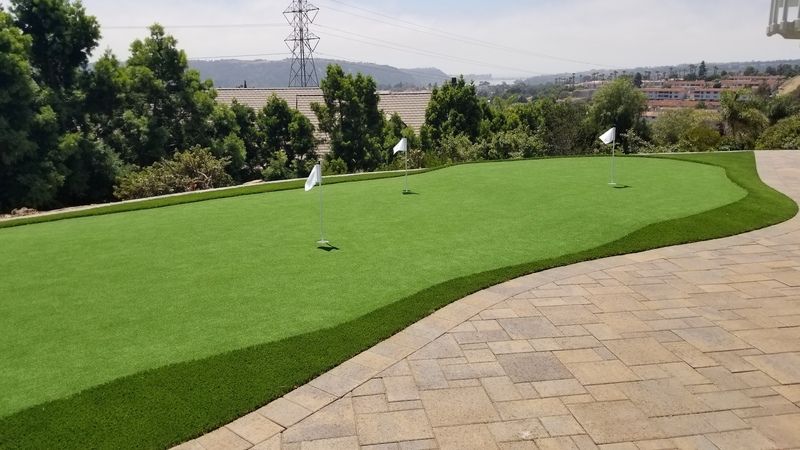 Home putting greens made from artificial grass don’t require the maintenance tasks of natural grass, consisting of watering, aerating, mowing, and fertilizing. They simply require a brush to remove and debris such as leaves that may litter the putting green. Although installing artificial grass has its upfront costs, there are costs that will be diminished due to the lack of maintenance. 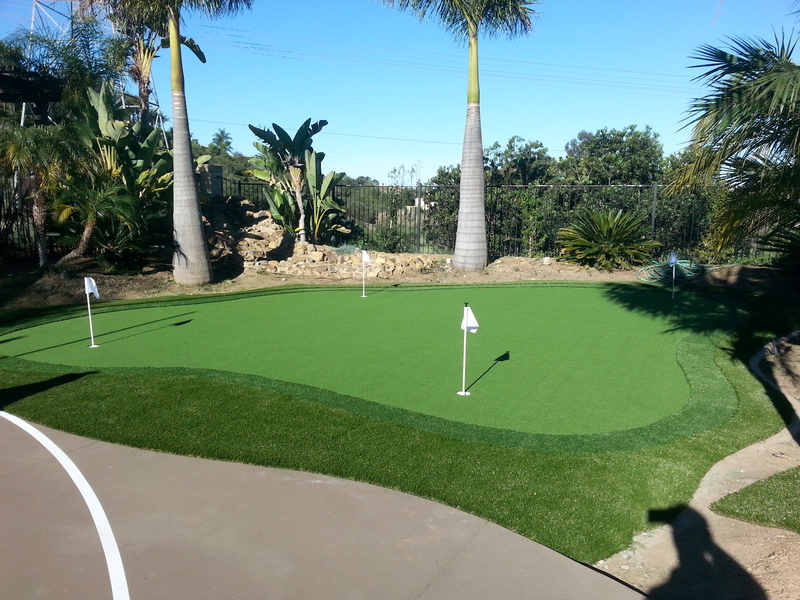 Not having to water the lawn and hire a landscaper are a few ways that a synthetic turf putting green can save you money. 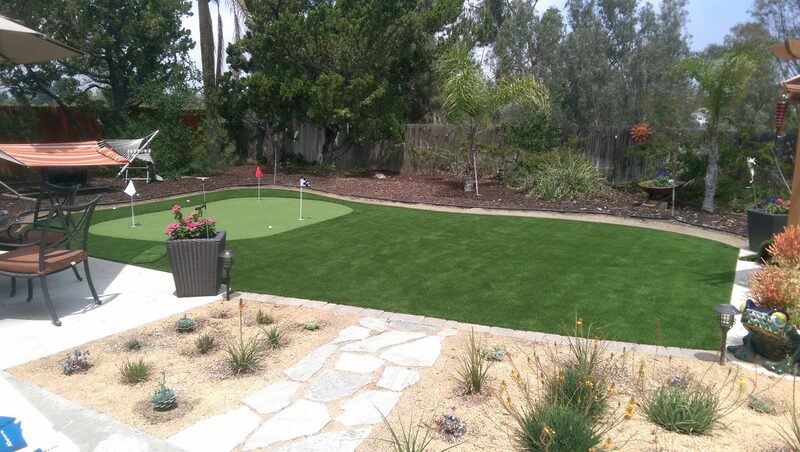 An artificial turf putting green is usable year round due to the durability of the material. No matter what time of the year or weather, you can step into your backyard and get some shots in. Additionally, the average lifespan of artificial grass products today is about 10 years, so you won’t have to worry about replacing it for a while. 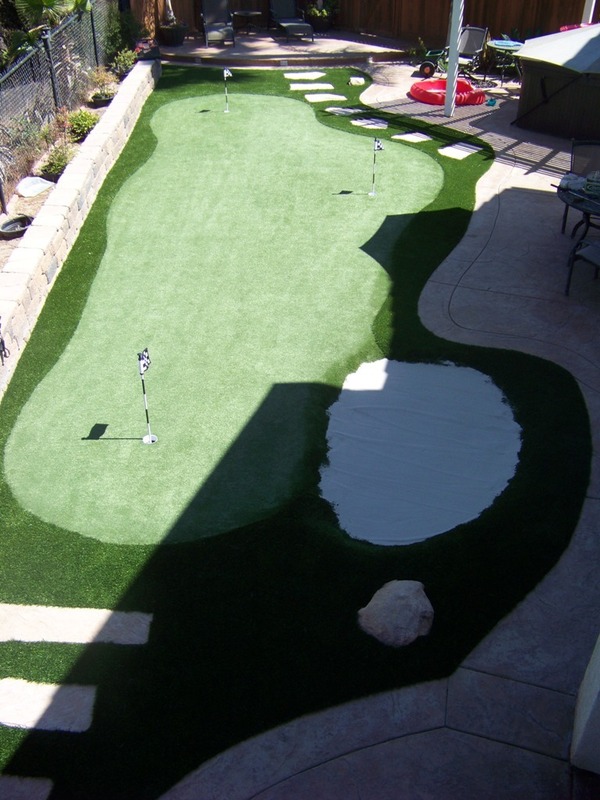 A custom putting green for your backyard can be used for more than just practicing golf. Kids and pets can run around on it, without worry of any rough spots. The underlay of the artificial grass absorbs falls better than any natural grass could. 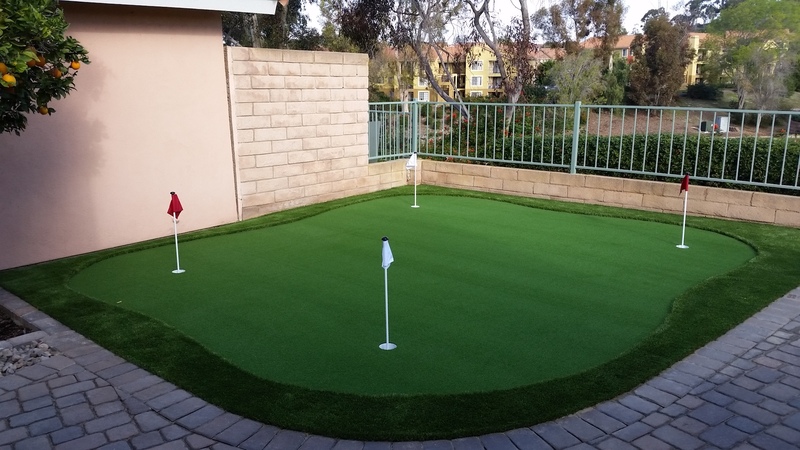 Also, kids can play on the putting green and avoid any itchy eyes, legs, or runny noses since it is hypoallergenic. Are artificial grass putting greens similar to natural grass? Yes! The artificial grass was made to look and perform similar to real grass. Backyard putting greens can be installed with different types of putting surfaces to ensure the balls roll similarly to the real thing. 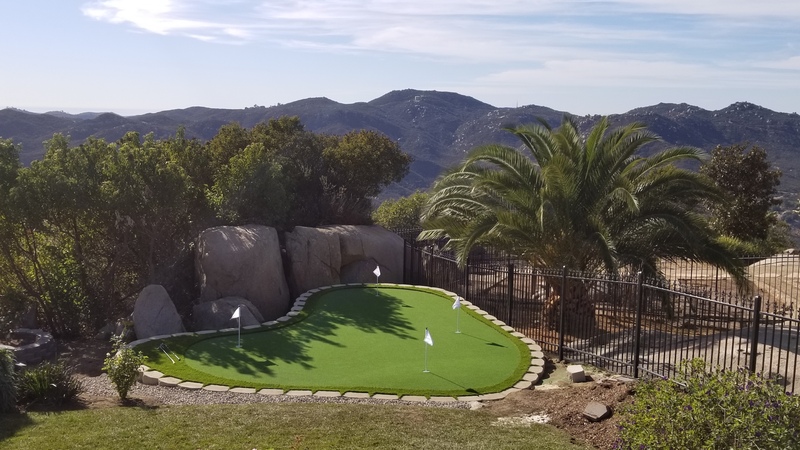 If you are looking to step up your golfing game, we can help design and install your next artificial grass putting green. Our team is able to accomodate most requests for your home putting green, whether that is a sand trap, undulation, multiple holes, or more. We service both San Diego and Orange County, so reach out to us today to start discussing your next project!